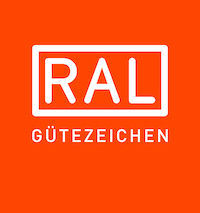 RAL quality assurance is the system by which all RAL Gütezeichen (Quality Marks) are approved and awarded. It is based on defined guidelines, specifies neutral principles and organises monitoring of the quality assurance specifications, punishes infringements during the use of the RAL Gütezeichen (Quality Mark) and ensures the regulated use of these labels. The system guarantees added quality and makes RAL Gütezeichen (Quality Marks) particularly reliable. Do you want to find out more? You can find further information about RAL Quality Assurance here. RAL Gütezeichen (Quality Marks) provide objective proof of quality because the quality of the labelled products and services is strictly monitored. This label thus indicates a special level of quality to consumers. At the same time, companies benefit from the reliability of RAL Gütezeichen (Quality Marks) and this allows them to stand out on the market. We provide you with comprehensive information in the advantages of RAL Gütezeichen (Quality Marks) section. The neutral approval procedure for fulfilling the quality assurance specifications for products and services is particularly advantageous for the award of public contracts: When issuing invitations to tender, public authorities can not only take an additional level of quality for granted but also know that the labels were based on neutral criteria that were developed in a company-independent process. In addition, the RAL Quality Assurance Associations ensure that the RAL Gütezeichen (Quality Marks) are always up-to-date. You can read more about it here: The advantages for public authorities.